Lion Basketball announces 2018-19 schedules and season tickets. COMMERCE– The schedules for the 2018-19 Texas A&M University-Commerce men’s and women’s basketball schedules have been announced and season tickets are now available for purchase. The Lion hoops teams will host 27 games at the Field House during the 2018-19 season, with the women’s team hosting 14 games while the men’s team will host 13 games. The Lions will host eight Lone Star Conference doubleheaders during the season. 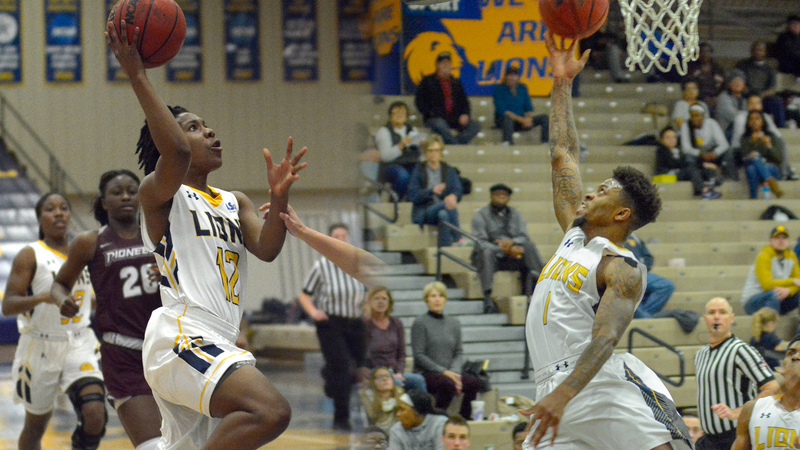 The Lion men’s basketball team finished the 2017-18 season with a 22-9 record. The team finished with a record of 10-1 in the Field House, enjoying a +11.0 scoring advantage on their home floor. The Lions reached as high as No. 10 in the national rankings during the season under first-year head coach Jaret von Rosenberg and won the program’s first NCAA playoff game since the 2004-05 season. The Lion women’s basketball team finished the 2017-18 season with 18 wins, their second season in a row reaching the 18-win mark under head coach Jason Burton and the fifth time in program history. The Lions finished with a 10-6 record on their home floor, relishing a +8.4 scoring advantage over their opponents. The Lions would advance to the second round of the LSC Tournament. Season tickets will encompass both the men’s and women’s schedules. The men’s squad will open up their home schedule on Nov. 13 against Our Lady of the Lake while the women’s team will host St. Edward’s on Nov. 16 in their first home contest of the season. The annual Education Day doubleheader will be against Angelo State on Nov. 29, with the men’s team beginning at 11 a.m. followed by the women’s team at 1 p.m. Season tickets are available for $85 with home games on 19 different dates. Single game tickets will be available as the season approaches. Game packages will also be available. Tickets are available by visiting WeAreLionsTix.com, calling Lion Sales & Service at (903) 468-8756, or visiting the LSS Box Office in the Field House during business hours. Links to both the men’s and women’s complete season schedules can be found below. Tue. Nov. 13 Our Lady of the Lake 7 p.m.
Thur. Nov. 29 Angelo State * 11 a.m. Sat. Dec. 1 Texas A&M-Kingsville * 4 p.m.
Mon. Dec. 3 Central Baptist 7 p.m.
Thur. Dec. 6 Dallas Baptist 7 p.m.
Thurs. Jan. 10 Tarleton * 7 p.m.
Thur. Jan. 24 Western New Mexico * 7:30 p.m. Sat. Jan. 26 UT Permian Basin * 4 p.m.
Thur. Feb. 7 Cameron * 7:30 p.m. Sat. Feb. 9 MSU Texas * 4 p.m.
Thur. Feb. 21 Eastern New Mexico * 7:30 p.m. Sat. Feb. 23 West Texas A&M * 4 p.m.
Fri. Nov. 16 St. Edward’s 7 p.m.
Thur. Nov. 29 Angelo State * 1 p.m. Sat. Dec. 1 Texas A&M-Kingsville * 2 p.m.
Tue. Dec. 18 Northeastern State 2 p.m. Sat. Dec. 29 Dallas Christian 2 p.m.
Tue. Jan. 8 Tarleton * 5:30 p.m. Sat. Jan. 12 Texas Woman’s * 2 p.m.
Thur. Jan. 24 Western New Mexico * 5:30 p.m. Sat. Jan. 26 UT Permian Basin * 2 p.m.
Thur. Feb. 7 Cameron * 5:30 p.m. Sat. Feb. 9 MSU Texas * 2 p.m.
Thur. Feb. 21 Eastern New Mexico * 5:30 p.m. Sat. Feb. 23 West Texas A&M * 2 p.m.
Lions picked fourth in LSC preseason poll; Chapron is preseason Defensive Player of the Year. 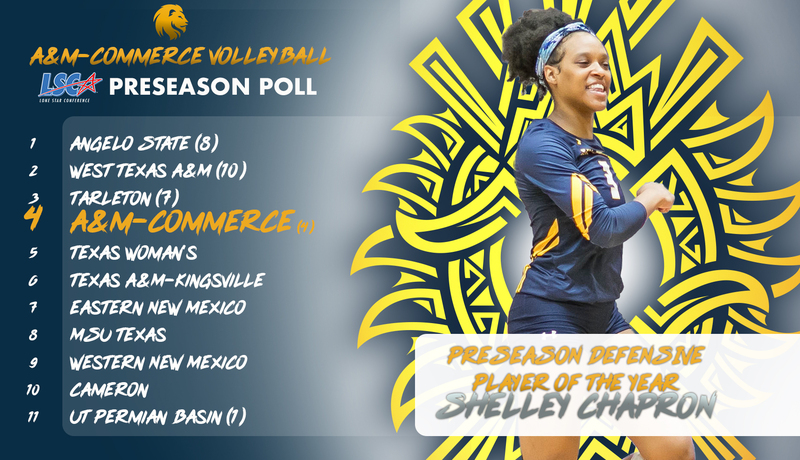 RICHARDSON – The Texas A&M University-Commerce volleyball team is predicted to finish in fourth place in the Lone Star Conference, while Lion junior middle blocker Shelley Chapron was named the Preseason Defensive Player of the Year. The LSC announced its annual preseason poll and superlatives on Wednesday. The Lions are coming off of a second place finish in the LSC in 2017, going 21-12 overall and 15-5 in the conference. A&M-Commerce qualified for the NCAA Division II Championship for the first time in 29 years and went an undefeated 11-0 at home during the campaign. Chapron (Houston – St. Pius X) was the LSC Newcomer of the Year, First Team All-LSC, and AVCA honorable mention All-South Central Region as a sophomore in 2017. She led the LSC with 155 total blocks last year, finished second in the league in blocks per set, and was fourth in hitting percentage. She had 16 matches with at least five blocks, including a season-high 11 blocks in a key conference win over Tarleton. She had a double-double with 12 kills and 10 blocks against West Texas A&M. The Lions are slated to return four starters from the 2017 season in Chapron, Academic All-American and all-region player Jaslyn Wacker (Austin – Vista Ridge), Mariyah Oliver (Waimea, Hawai’i), and libero Savannah Rutledge (The Woodlands – College Park). Angelo State is predicted to win the league, though West Texas A&M earned the most first-place votes. The top four schools are all within a 41-point range. A total of 30 voters between the league’s head coaches, sports information directors, and media members cast their ballots for the poll. Other LSC preseason superlative winners were Texas A&M-Kingsville’s Madison Brabham as preseason Offensive Player of the Year and Angelo State’s Meghan Parker as preseason Setter of the Year. The Lions start the season on Friday, August 24, with matches against Harding and Black Hills State in the first day of the Tarleton Invitational. The Lions will play their second tournament on August 31 and September 1 at the prestigious Colorado Premier Challenge, including a match against Concordia-St. Paul, which has won the last two Division II national championships and nine titles in the last 11 years. A&M-Commerce will host 11 matches in the Field House, including 10 LSC matches. The home schedule kicks off on Tuesday, September 11, against local rival Texas Women’s. Season tickets are only $50 and are available at WeAreLionsTix.com or by calling (903) 468-8756.